I honestly think that this is one very thing the entire human race would agree on, unequivocally. Like, who wouldn’t agree with me that salmon is special? Hello? Well, salmon is a special kind of fish. It is nutritious, delicious and a little more expensive than other regular fish(es). Some people eat salmon only on a special occasion like anniversaries, Valentine’s Day, birthdays, etc. Others eat it just in restaurants because they do not know how to prepare it restaurant-style (and are afraid to mess it up). 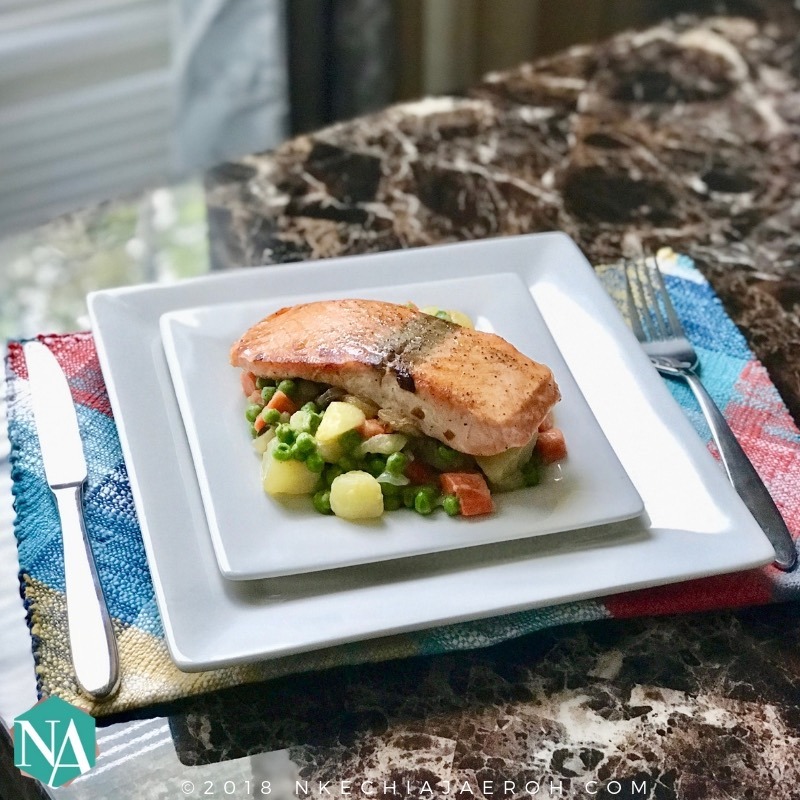 Today, I am happy to show you a salmon recipe that is so easy yet finger licking delicious, and it will blow your mind. Say hello to my pan-seared salmon in caramelized onions with pot pie-style vegetables! Had to make sure they were room temperature before I prepared them. I love that I paired this dish with varieties of vegetables. This is one of those dishes that I feel like I own myself the honor and justice to use fresh carrots. In other words, for this dish, I am more than willing to do the extended duty of peeling and chopping fresh carrots. Don’t ask me why it’s “intuition,” you can use frozen, am sure it would work just fine. Also, I go simple when it comes to the vegetables I use (for this dish); fresh carrots, fresh potatoes, fresh onions, and frozen peas. Feel free to stick with the veggies that you love instead of the above, just remember I cannot guarantee (precisely) the same result. And that’s ok because cooking allows us to explore and recreate the same meal differently. Nevertheless, ensure that you use vegetables with beautiful colors and flavors. One of the things that got my kids interested in this dish in the first place is the color; they love the colorful vegetables. Am sure most kids and adults do. These were the actual vegetables I used, like I mentioned I love using fresh carrots and potatoes. Obviously fresh onions and garlic as well. As has been noted, this meal is deliciously good! It goes by so fast as soon as it gets to the dinner table. Just so you know. All in all, this is a classic dish you can make for any (and every occasion). Thanksgiving, Christmas, Valentine’s Day, Easter, wedding, baby christening, dedication or just for you and your loved ones. Let's get cooking. Have fun making this dish by using your favorite veggies. Also ensure that you do not over cook the salmon or the vegetables. This is such a delicate meal you make for you and your loved ones. Enjoy! ¼ - 1/3-cup of oil for searing the salmon and 2 tablespoons more for cooking the vegetables; any choice of vegetable oil works. Wash and cut potatoes in 1-2 inch sizes; you need about 4 cups. Wash and cut all the other vegetables: carrots, onions, and garlic. Precook potatoes in boiling water with a teaspoon salt for 6-8 minutes or until it is halfway cooked. Then drain the water and set aside. Set a clean pan on a medium – high heat on a stove. Add vegetable oil, and allow to heat up. Then add some salt, onions, and garlic and allow to cook for 2-3 minutes while stirring continuously. Add carrots to the pot, continue to stir and cook for about 5 – 6 minutes, it should still be crunchy. Now add potatoes, peas, 1 seasoning cube (or a teaspoon seasoning powder) and give a good stir. Then sprinkle the flour and stir one more time. Cover the pot and cook for 3 minutes (on low heat) so that the flour is no longer raw. Stir in ½ cup of milk, and ¼ of water. Crush in another seasoning cube, pepper, rosemary, as well. Cover the lid and cook for 5 minutes while stirring in between. Taste and adjust flavors, (if needed), and your pot pie-style vegetables are ready. Empty into a clean dish and set aside until salmon is ready for serving. Cook salmon for 6 minutes on each side; repeating the same process. After 6 minutes on the second side (12 minutes total), reduce the heat, cover the lid, and allow to simmer down for another 2-3 minutes. Do not overcook. Salmon is ready after 3 minutes; gently remove from the pot and place on serving plates. Serve with already prepared potpie style veggies. Garnish with fresh rosemary, scallions or parsley. Be careful not to let the vegetable to dry out, it has to be moist that’s why kids love it. If it becomes dry then you will need some stew or gravy. Be careful and always lower heat before turning salmon to avoid breakage. Ensure to use a pan that can accommodate all the four salmons at the same time. It makes it easier. Endeavor to cut the spiral onions equal to ensure even cooking time. Personally, I do like dividing the vegetable oil so I can cook both the vegetables and salmon in separate oil. I don’t want my veggies smelling fishy. © 2018 NkechiAjaeroh.com All Right Reserved. What is your favorite salmon love story (and recipe? of course) Share in the comment below. And just in case you are looking for another yum recipe, it might be in my kitchen. Please share out this post if you enjoyed it because "healthy eating starts in the kitchen." Also, come hang out and get exclusive healthy tips, recipes, and MORE for living your best healthy life! Hi, I'm Nkechi "Kechi" Ajaeroh, a Public Health professional turned Inspirational author slash exceptional home cook. A 2x International Best Selling Author of Elevate Your Life with the Power of Positive Perception and Gratefully Growing. African, (specifically, Nigerian) Food Enthusiast, watermelon connoisseur, on my to finessing my fitness. This blog is all about loving food, living life, practicing gratitude, and inspiring you to use your wings. Join the journey. Are you ready to fly? 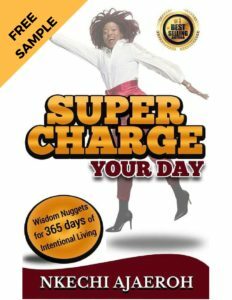 BECOME INTENTIONAL and WIN with this free Supercharge Your Day book sample.